I have been looking at the National Rail timetables and it appears that certainly on Monday and possibly tomorrow, trains are timetabled to run between Leeds and Manchester Oxford Road stations, stopping at Manchester Victoria station. This means that weather permitting, the Ordsall Chord is expected to be open. Weather permitting of course! It’s now Sunday morning and according to the National Rail train departures system, the 08:57 train from Manchester Oxford Road to Leeds is ready to rumble. The article in The Independent is entitled Six Minute Rail Link Promises To Transform North West Train Services. It gives this precise explanation of what the Ordsall Chord is all about. I would assume that this short length of railway, has been built so that it can handle a high frequency of trains across the City. So if it has been traditionally signalled like the East London Line of the Overground train frequencies of upwards of twelve trains per hour (tph) will certainly be possible. But modern signalling using ERTMS, will give this route a frequency up there with Crossrail and Thameslink of twenty-four tph. Manchester has got its Crossrail, a year before London. I don’t think Manchester knows what is going to hit the City! A lot of local services at Manchester Victoria are arranged so that they run back-to-back connecting pl;aces like Blackburn, Kirkby, Southport, Stalybridge, Todmorden and Wigan. Now services will run back-to-back through the core of Victoria, Salford Central, Deansgate, Oxford Road, Piccadilly and the Airport. Manchester has gained a Third City Crossing! It needs a frequency of at least twelve tph or one train every five minutes. On the section between Deansgate and Piccadilly, there will be even more trains. Piccadilly to Blackpool, Bolton, Preston and Southport services via Salford Central and the Windsor Link Line. 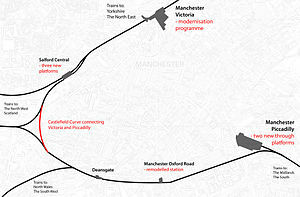 Summing this spaghetti up, you get destinations to the North of the Irwell. The stations marked with asterisks (*) will be fully electrified by the end of 2018. Piccadilly is not included in the list of stations South of the Irwell, as it is not a station, where trains can be reversed to go North. Oxford Road can be used to reverse trains and it is significant the the first Ordsall Chord services are between Oxford Road and Leeds. There is a lot of scope for back-to-back services across the Irwell using the current Class 319 trains, that work Liverpool to Manchester, Preston and Wigan services. Thinking about what Manchester has now got, it’s more like Thameslink than Crossrail, as it has a lot of branches on both sides of the Irwell. So perhaps it should be called IrwellLink? Northern have another train up their sleeve! Or should I say, under construction in Loughborough? At least eleven of the Class 769 bi-mode train are coming! On paper these trains seem a bizarre but simple idea! You take a nearly thirty-year-old British Rail Class 319 train and fit two diesel alternator sets underneath, so that it can generate its own electric power on lines without electrification. But in practice, it appears Northern will be getting a train that can do the following. Bridge all the electrification gaps in the North-West of England. Work the very stiff Manchester to Buxton route. Do 100 mph under the wires and 90 mph on diesel. Meet all the regulations with respect to Persons of Reduced Mobility. Deputise for and augment Class 319 trains when required. Give a performance improvement over Pacers and Class 150 and Class 156 trains. Work into most stations, where Pacers and Class 150/156 trains currently work, without station upgrades. All this comes in a strong Mark 3-based design, that drivers seem to like. I think that Northern said a lot about their confidence in these trains, when they increased the order from eight to eleven, around the time serious testing started. If more than eleven Class 769 trains are needed, there are a total of 86 Class 319 trains of which 32 are the Class 319/4 variant, which would be the preferred conversion, as they have a better interior. The Class 769 trains could work between Leeds and Oxford Road stations, as soon as they receive certification. But surely, one of their main uses will be to link destinations on lines without electrification on either side of the electrified core lines in Manchester. This map from Wikipedia shows the layout of the main lines and stations in Central Manchester. Starting at the top and going anti-clockwise the stations are as follows on the lin, which is fully electrified. The Ordsall Chord is shown in red. Note that most of the lines radiating from the cross-city line can be joined to the others. This leads to services such as. Crewe to Blackburn via The Styal Line, Piccadilly, Victoria, Todmorden and Burnley. Sheffield to Liverpool via the Hope Valley Line, Stockport, Piccadilly and Warrington. Feel free to add any route you feel convenient. Add in a few extra platforms at perhaps the two Salford and Oxford Road stations and Manchester could have a rail network, that would be second-to-very-few. There are also a lot of opportunities around Leeds and along the East Coast Main Line. Relatively clear here in Manchester, but snowing now :-(. I noticed an incoming Pendelino snow and ice caked on its skirts and bogies. Only one train each way every other on the chord to start with pending “introduction of the electric timetable” – which is frankly pathetic. Similar soft start on Thameslink in January. Also noticed what looked like a class 319 repainted in Northern colours. The Class 319 fits. They will want to run both Class 319 and Class 769 trains over the chord , so why not do a bit of testing in real conditions? As the two classes are probably identical running on electricity,, running a Class 319 back and forth certifies the track for both trains. It could of course have been a Class 769 train on test, as without reading the number, there’s no difference externally. Leeds to Oxford Road would be a superb test route for the bi-mode train. It might even improve timings, as a Class 769 train will do 100 mph under the wires and 91 mph on diesel with better acceleration. Don’t forget that Trans Pennine Express services from Manchester Airport to York, Middlesbrough and Newcastle will start operating this way so the destinations in the North East will use the chord. Thanks! I wonder how many people will avoid the scrum at Piccadilly, by using Victoria or Oxford Road for TransPennine services.